*This advisory was edited May 7 to reflect the updated target date for the second spacewalk, which now is June 14. Two NASA astronauts are scheduled to venture outside the International Space Station for a pair of six-and-a-half-hour spacewalks May 16 and June 14. 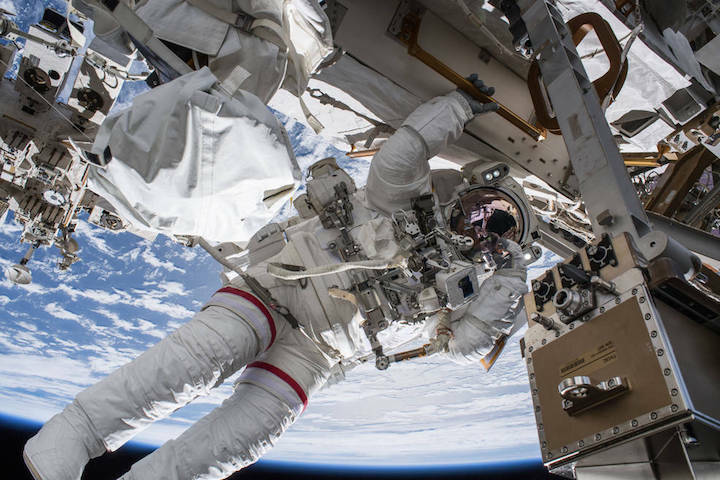 Experts from NASA will preview the work to be done during the spacewalks in a briefing at 2 p.m. EDT Tuesday, May 8, at NASA’s Johnson Space Center in Houston. Expedition 55 Flight Engineers Drew Feustel and Ricky Arnold will put on spacesuits for what will be the 210th and 211th spacewalks in support of station assembly, maintenance and upgrades. These spacewalks will be the eighth and ninth of Feustel’s career, and the fourth and fifth of Arnold’s. The primary objectives are to finish upgrading cooling system hardware and install new and updated communications equipment for future dockings of commercial crew spacecraft. Media wishing to participate in the May 8 briefing in person must request credentials from the Johnson newsroom no later than 4 p.m. Monday, May 7. Media interested in participating by phone must contact the newsroom by 1:45 p.m. May 8. The first spacewalk will begin about 8:10 a.m. Wednesday, May 16. NASA TV coverage will begin at 6:30 a.m. Feustel and Arnold will move a component called a Pump Flow Control Subassembly (PFCS) from a spare parts platform on the station’s truss “backbone” to the Special Purpose Dexterous Manipulator (Dextre) robotic arm. The PFCS drives and controls the flow of ammonia through the exterior portions of the station’s cooling system. Robotics controllers on Earth will use Canadarm2 and Dextre to perform final installation on the port-side truss for checkout. The spacewalkers will remove a failed PFCS and return it to the spare parts depot. They’ll also replace a camera system on the Destiny Laboratory and a communications receiver. This also be the 50th spacewalk originating from the station’s Quest airlock. Other assembly and maintenance spacewalks have begun from space shuttle and Russian airlocks. The second spacewalk is planned for Thursday, June 14, following the anticipated May 24 arrival of the Orbital ATK Cygnus cargo resupply spacecraft. The ninth Cygnus cargo mission is scheduled to launch May 20 from NASA’s Wallops Flight Facility in Virginia. During the June 14 spacewalk, Arnold and Feustel will install a pair of brackets and high-definition cameras on the Harmony module that will help commercial crew vehicles align with the international docking adapter at the forward end of Harmony. The cameras also will provide wireless data network access for experiments and facilities mounted on the ESA (European Space Agency) Columbus laboratory and Japan Aerospace Exploration Agency Kibo laboratory. The crew also will replace a camera on the station’s starboard truss.